Sophisticated. Elegant. Timeless: introduce classic chic to your home. Are you a fan of exquisite materials? If your décor has a coherent style and exudes elegance and timeless charm, your walls need to look the part. Refined wallcoverings in unobtrusive colours are perennial classics. Of course, that doesn’t mean that you can’t also introduce colour accents, too. Shades of regal gold, bordeaux, forest green and dark blue all underscore the classic-chic look. Your home is transformed into a haven of comfort, with just a touch of opulence. And if you want the ultimate in glamour, our collection also includes patterns with ornamentation. Bring a sense of tranquillity and sensual indulgence to your space. Opt for silk-matte, cosy colours to give your home an atmosphere of superlative comfort. The gently clouded colourways, with their watercolour look, are a case in point. Classic ornamentation and elegantly modern sweeps of colour can be combined with different concrete looks, resulting in the perfect backdrop for your interior style. These wallcoverings glint and sparkle against a velvety-soft background. Muted colours that are ideal for living spaces combine with a refined, coruscating granular material and plenty of fabulous glitter, to make your walls absolutely resplendent. Classic, restrained patterns give a sense of discreet timelessness and make the design perfect for pairing with classic furniture. A classy shimmer and soft sheen define this year’s most fashionable fabric: velvet! Fortunately, this sophisticated cloth is no longer the sole preserve of the aristocracy; indeed, we can now clad our walls with the stuff. 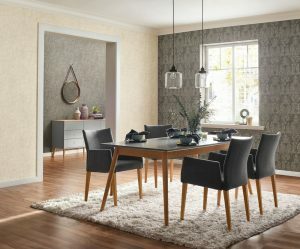 These wallcoverings are bound to turn heads, thanks to their textile feel and elegant patterns. Velvet is the new silk and can imbue your walls with newfound beauty in an instant. Fancy injecting a bit of Italian flair into your home? This collection imitates Mediterranean charm to perfection. Delicate textures in different cream and sand tones are combined with wide, blocky stripes that provide something a bit different, in sophisticated mustard yellow, grey and sky blue. Glossy, outsize plaques and baroque ornamentation round out the effect. Simply bellissima!